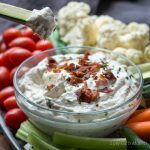 Creamy bacon horseradish dip is the perfect low carb dip for veggies or low carb crackers. Use Greek yogurt or sour cream in this easy recipe. One of my favorite things to nosh on at parties and gatherings is crunchy snacks like dips and veggies. I don’t expect a host to have special low carb appetizer options for me, but I know that I can expect to find the ubiquitous vegetable tray. It’s been my savior at many a party. In fact, I often bring my own low carb snacks to share. 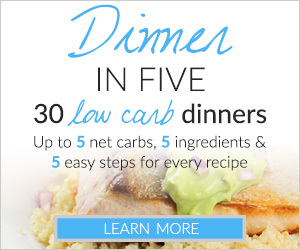 They are always a hit and no-one knows they’re low carb, they just know they’re delicious! 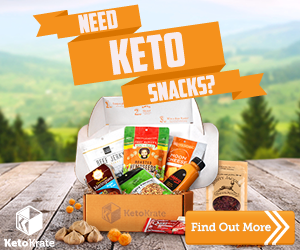 I have an obsession with crunchy low carb snacks– especially low carb crackers or vegetables. 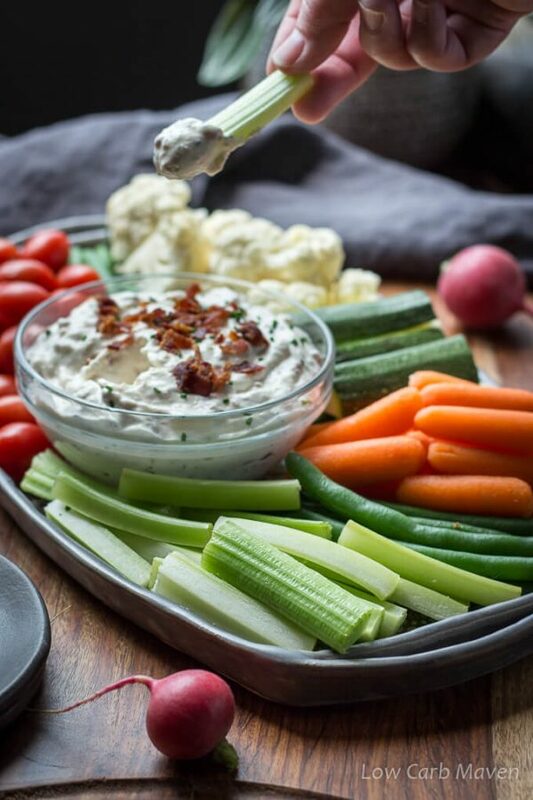 I suppose it’s because they’re such great vehicles for creamy dips like this bacon horseradish dip, which is yummy on its own, but even better when paired with crunchy things! Let’s be honest, the only reason many of use eat the veggies at parties is because of the dip, right? 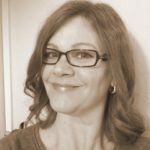 I used to buy a creamy bacon horseradish dip from the grocery store. I was really good, but it had a lot of sugar in it. This version doesn’t. Instead, it calls for a little low carb sweetener to tone-down the sharpness in the dip. You an add it to taste. 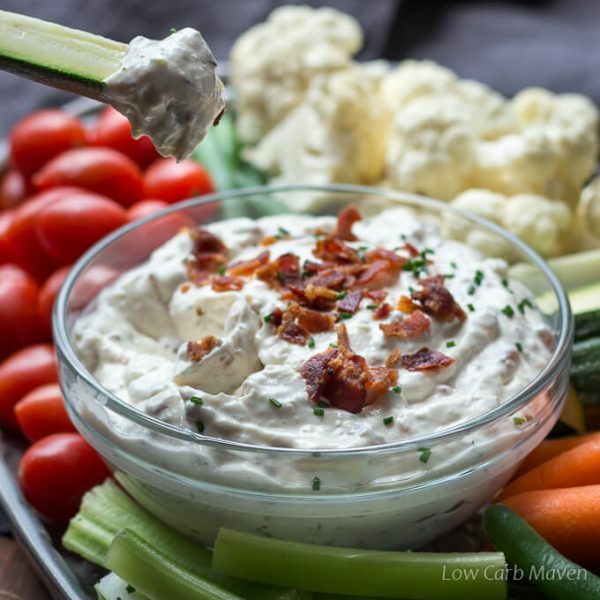 This creamy low carb dip is made with Greek yogurt, Fage brand. Yogurt is full of beneficial bacteria which helps promote a healthy gut. Greek yogurt can be subbed for sour cream in many recipes, but is best when used in cold recipes to preserve the integrity of the yogurt cultures. 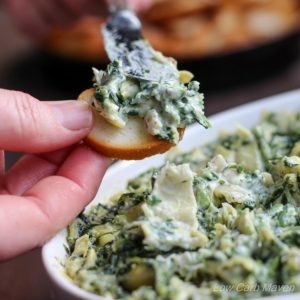 This dip is loaded with bacon and flavored with green onion and dill. The over-all flavor is tangy, but as I mentioned, you could add more sweetener if you want. 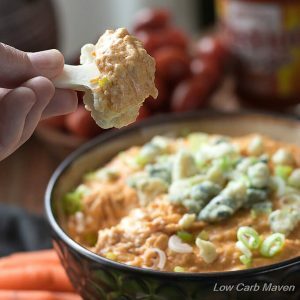 If you are having low carb or keto friends over for football or a party, make sure to include a bowl of pork rinds or these great cheddar cheese crackers (which taste like cheeze-its) instead of chips. Some recipes taste better the next day. Same with this recipe. Make sure to prepare it the night before so the flavors can develop before serving. 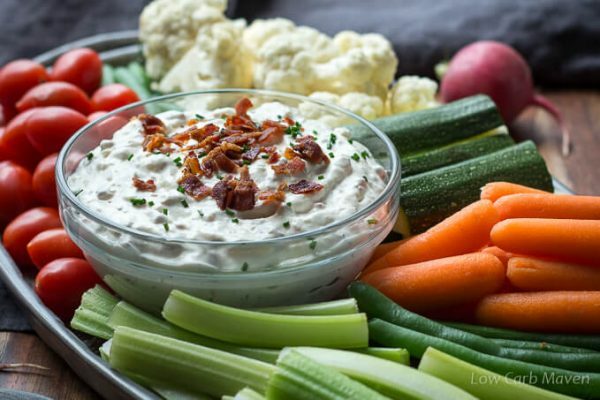 This recipe for Creamy Bacon Horseradish Dip serves 6 people at 1 net carb per serving. Chop bacon and crisp in a pan over medium heat. This takes about 6 minutes. Meanwhile, gather the other ingredients and mince the green onions. Blend all ingredients together and refrigerate overnight. Makes 1 1/4 cups. Serves 6 at 3 tbsp each. Just curious if anyone had tried this without the sweetener? WOW! I love veggies and dip! This veggie tray is gorgeous. I can’t wait to try. 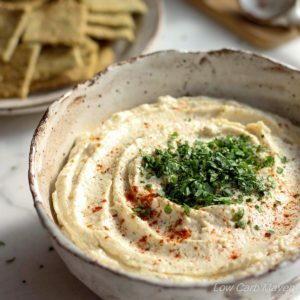 That is a delicious looking dip, I love horseradish! 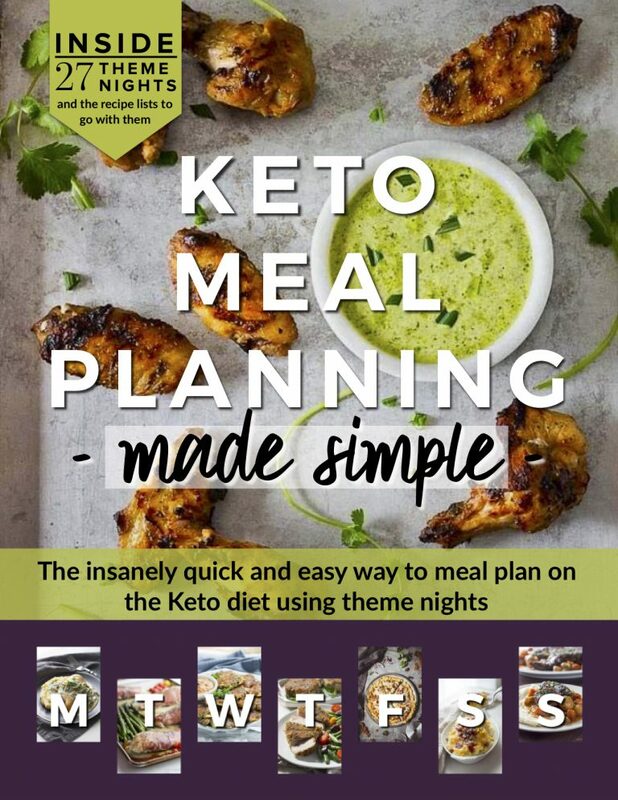 These made a nice low carb snack! Yum! Never tried a horseradish dip before! This is definitely something I need to try. The dip is really good with the herbed crackers – flavors compliment each other nicely.